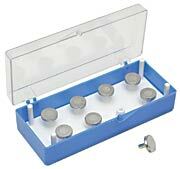 Versatile, cost effective SEM pin mount storage box and holder for pin mounts with a ø3.2mm (1/8") pin. Numbered 1-18 with the spacing designed to accommodate all types of pin mounts with a diameter from 6.4 to 50mm. Can hold 18 of 12.7mm pin mounts, 8 of 18mm pin mounts, 8 of 25mm pin mounts, 2 of 32 or 38 or 50mm pin mounts with space left for the smaller pin mounts. Maximum specimen height between mount surface and closed lid is 16mm (5/8"). Used for FEI/Philips, ZEISS/LEO/Leica, Cambridge CamScan, Tescan, Amray and ETEC SEMs. Box inside dimensions are: 4-5/8" x 2-2/4" x 1-5/16" (11.7 x 7.0 x 3.3cm). 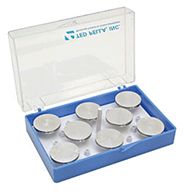 Very strong and rugged clear polycarbonate box to store standard pin mounts with 3.2mm (1/8"). This box is watertight, crushproof and dustproof. 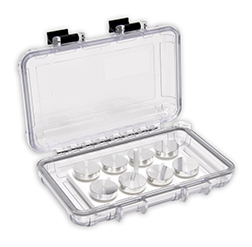 The strong hinges, locking clasps and soft silicone O-ring seal makes this an ideal transport, shipping and storage box for SEM samples on pin mounts. The holder insert is numbered 1-18 and accommodates all types of pin mounts form 6.4 to 50mm diameter. Same storage capacity as #16709. 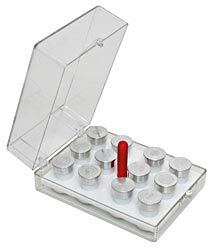 "Standard" plastic box with pin stub specimen holder. For ø12.7mm (1/2") SEM pin mounts with ø3.2mm (1/8") pins. Box inside dimensions are: 2-7/8" x 1-3/16" x 3/4" (7.3 x 3 x 1.9cm). 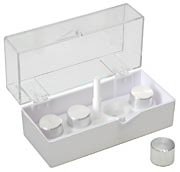 "Standard" plastic box with specimen holder. For ø9.5mm (3/8") JEOL cylinder mounts. 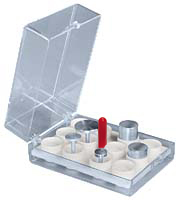 The “Standard” plastic box with specimen holder. This box is ideal for JEOL 12.2mm cylinder mounts and will hold 12.5mm dia, mounts but 12.5 fit will be very tight. For 12.5mm diameter JEOL cylinder mounts. "Tall" plastic box with SEM pin mount specimen holder. Slip over retaining peg is included to keep holder in place if box is tipped or inverted. For tall specimens on 12.7mm (1/2") pin stubs with 3.2mm (1/8") pin. Box inside dimensions are: 2-7/8" x 3/16" x 1-1/4" (7.3 x 3 x 3.2cm). "Tall" plastic box with JEOL 9.5mm specimen holder. Slip over retaining peg is included to keep holder in place if box is tipped or inverted. For tall specimens, 3/8" (9.5mm) JEOL cylinder mounts. "Tall" plastic box with specimen holder. Slip over retaining peg is included to keep holder in place if box is tipped or inverted. This box is ideal for JEOL 12.2mm cylinder mounts and will hold 12.5mm dia, mounts but 12.5 fit will be very tight. 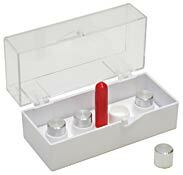 Universal Specimen Holder with removable stand-off pin that keeps the holder in place if box is tipped or inverted in storage box. Very strong and rugged clear polycarbonate box to store standard Hitachi SEM mounts with M4 threaded hole in the base. This box is watertight, crushproof and dustproof. 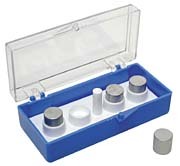 The strong hinges, locking clasps and soft silicone O-ring seal makes this an ideal transport, shipping and storage box for SEM samples on pin mounts. The holder insert is numbered 1-10 and accommodates Hitachi SEM mounts from 15-32 mm diameter. Same storage capacity as #16791. This storage box accepts threaded Hitachi Mounts. Holds either 12 each of 15mm or 6 each of 25mm mounts. Insert in base of the box has 12 M4 screws. 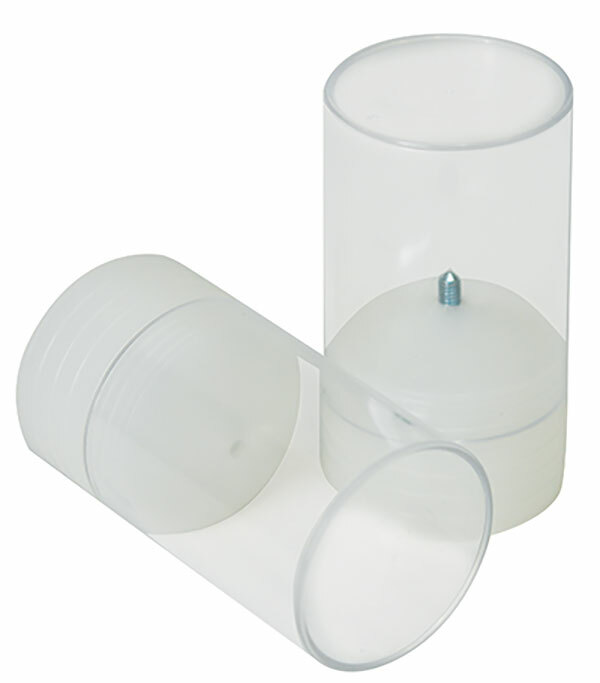 Maximum specimen height for 6mm high Hitachi SEM mounts is 12mm with closed lid. 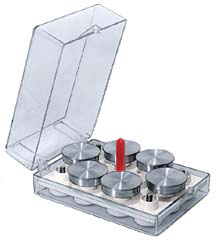 The PELCO® Vacuum Desiccator for Hitachi M4 Sample Mounts holds either 5 of the 15mm diameter Hitachi M4 mounts or two of the 25mm diameter Hitachi M4 mounts. Storage under vacuum eliminates contamination or dust. Allows for a 7mm (0.27") specimen height on the mounts. 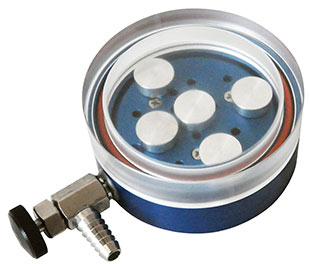 The use of durable, non-outgassing, blue anodized aluminum and Silicon O-rings makes it suitable for pumping down to 10-3 mbar. Capable of holding vacuum for many weeks. Metal vacuum valve with PTFE shaft seal. Use a small vacuum pump to evacuate. Vacuum connection for pump-down is a 1/4" (6.35mm) barb fitting. Overall size w/o vacuum valve is ø76 x 35mm (3" x 1.4"). Cavity height is 13.7mm (0.54"). 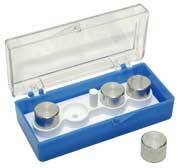 Specimen holder and box for storing up to 8 of ø12.7mm pin mounts (ø3.2mm - 1/8" pin), used in FEI/Philips, ZEISS/LEO/Leica, Cambridge, CamScan, Tescan, Amray and ETEC SEM's. Inside box dimensions are: 4-1/2" x 1-3/4" x 1-1/8" (11.4 x 4.4 x 2.9cm). Storage Box and Holder for 14 of 12.7mm dia. or 8 of ø25mm pin mounts (ø3.2mm - 1/8" pin). Numbered 1 - 14. Used for FEI/Philips, ZEISS/LEO/Leica, Cambridge, CamScan, Tescan, Amray and ETEC SEM's. Inside box dimensions are: 4-5/8" x 2-7/8" x 1-1/4" (11.7 x 7.3 x 3.2cm). 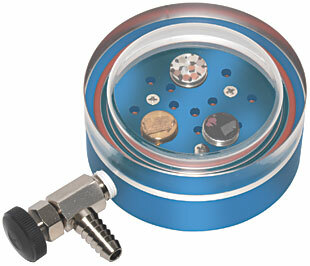 Pin mounts with the standard 3.2mm (1/8") pin diameter are protected and held securely in the base (cap) of the tube. Can be used for pin mounts up to 18mm diameter. Pin mounts are sold separately. Inside dimension of clear tube: ø21mm (0.83"), max sample height on stub is 20mm (0.79"). Outside dimensions are ø23mm (0.9") with a height of 52mm (2.05"). Clear tube is made of polystyrene, cap is made of low density polyethylene (LDPE). Sold in packs of 10. A 15mm diameter, M4 threaded Hitachi mount can be protected and held securely in the cap (base) of the tube on a M4 screw. Suitable for ø15mm Hitachi Mounts. Hitachi Mounts are sold separately. Inside dimension of clear tube: ø21mm (0.83"), max sample height on stub is 20mm (0.79"). Outside dimensions are ø23mm (0.9") with a height of 52mm (2.05"). Clear tube is made of polystyrene, cap is made of low density polyethylene (LDPE). Sold in packs of 10. Large pin mounts with the standard 3.2mm (1/8") pin diameter are protected and held securely in the base (cap) of the tube. 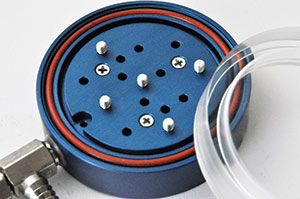 Can be used for pin mounts up to 38mm diameter. Pin mounts are sold separately. Inside dimension of clear tube: Ø39mm (1.53"), max sample height on stub is 30mm (1.18"). Outside dimensions are Ø40mm (1.57") with a height of 75mm (2.95"). Clear tube is made of polystyrene, cap is made of low density polyethylene (LDPE). Sold in packs of 10. A 38mm diameter, M4 threaded Hitachi mount can be protected and held securely in the cap (base) of the tube on a M4 screw. Suitable for up to Ø38mm Hitachi Mounts. Hitachi Mounts are sold separately. 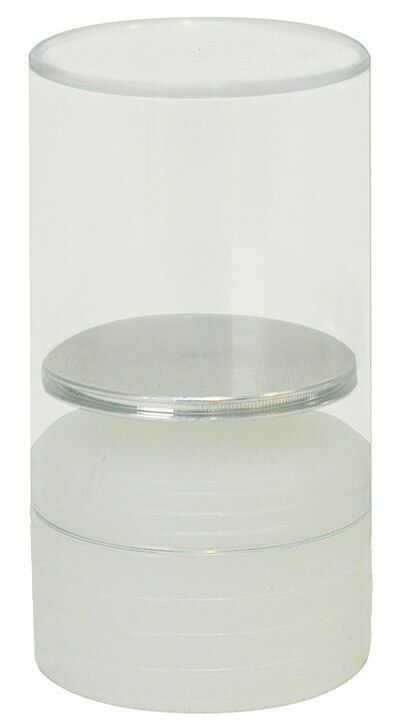 Inside dimension of clear tube: Ø39mm (1.53"), max sample height on stub is 25mm ( 0.98"). Outside dimensions are Ø40mm (1.57") with a height of 75mm (2.95"). Clear tube is made of polystyrene, cap is made of low density polyethylene (LDPE). Sold in packs of 10. 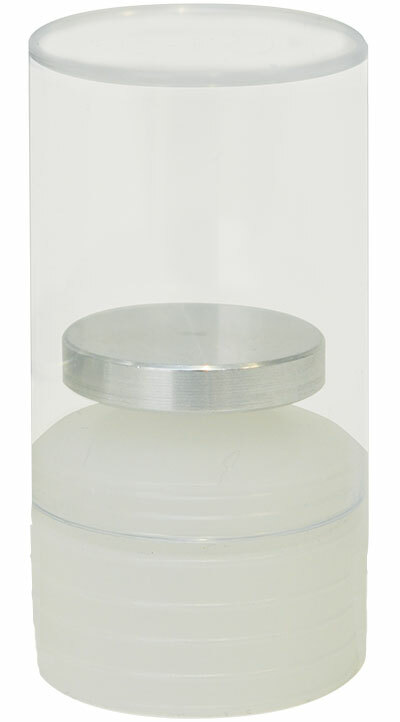 The durable and versatile PELCO® SEM Pin Stub Vacuum Desiccator holds up to 12 standard ø12.7mm (1/2") pin stubs, or two ø25mm (1") or 1 up to ø50mm (2") SEM pin stubs. 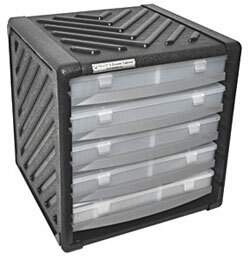 Storage under vacuum eliminates contamination or dust. Allows for a 10mm (3/8") specimen height on the pin stubs. The use of durable, non-outgassing, blue anodized aluminum and Silicon O-rings makes it suitable for pumping down to 10-3 mbar. Capable of holding vacuum for many weeks. Metal vacuum valve with PTFE shaft seal. Use a small vacuum pump to evacuate. Vacuum connection for pump-down is a 1/4" (6.35mm) barb fitting. 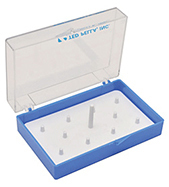 Fold-up insert which accepts 8 specimen mounts: ø12.7mm (1/2") head, ø3.2mm (1/8") pin. Shipped flat. 7cm long x 3.8cm wide x 3.5cm high (2-3/4" x 1-1/2" x 1-3/8"). Pin mounts are not included. 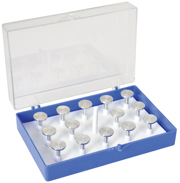 This practical pin mount stand made out of clean solid aluminum is either useful for storage or specimen preparation of large numbers of pin mounts. The pin mount stand can hold 40 of the standard 12.7mm (1/2") pin mounts or 12 of the 25mm (1") mounts. The pin mount stand is compatible with all types of SEM pin mounts up to 100mm (4") diameter and with the pin mount type SEM specimen holders. Six of these pin mount stands fit on a shelf in a 12"x12"x12" desiccator creating a storage capacity of 240 standard pin mounts per shelf!. Also very practical for storing pin mount type SEM specimen holders. The PELCO® Pin Mount Stand can also be used for supporting pin mounts and pin type SEM specimen holders when mounting specimen. Ideal when preparing large numbers of specimens. One corner of the pin mount stand has a notch to aid as a locator. Overall size is 137x89x16mm (5.39"x3.5"x0.63"). Sturdy wooden box with a clear, resilient finish inside and out. Nickel plated latch and hinges additional durability. 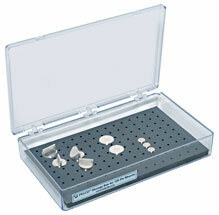 This box provides storage for up to 154 of ø12.7mm (1/2") pin mounts. There is a storage map in the lid and mount pins are held in place by perforated rubber foam attached to the bottom. Outside dimensions are 24.8 x 19.7 x 5.2cm (9.75" x 7.75" x 2.06"). Inside dimensions are 22.9 x 17.8 x 2.8cm [above foam] (9" x 7" x 1.1" [above foam]). 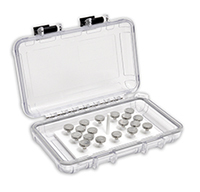 Clear styrene hinged storage box with closed cell rubber foam which holds up to 135 of ø12.7mm (1/2") pin mounts. Foam is glued to the base of the box. Complete with latched and hinged lid. There is a storage map provided with the box. Internal dimensions are 267 x 157 mm ( 10-1/2" x 6-3/16") with a maximum sample height of 24mm (15/16") on the pin stub. 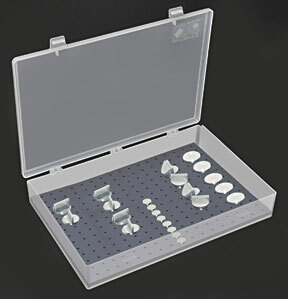 This robust plastic 5 drawer cabinet stores up to 1300 standard 12.7mm (1/2") pin mounts in 5 drawers. 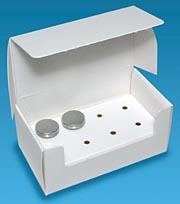 Each drawer features a removable clear polypropylene box with hinged lid and latches so you can take that box to the SEM or preparation station for specimen transfer. 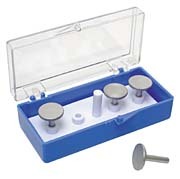 The pin mounts are held in closed cell rubber foam which is glued to the bottom of the box. 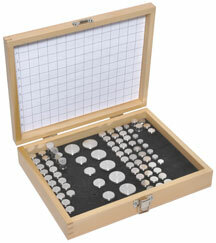 Each box in the drawer holds 260 standard 12.7mm (1/2") pin mounts. The lids on the box minimize moisture and dust affecting the contents. 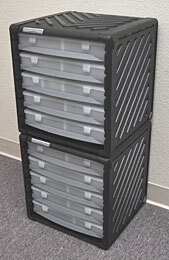 A storage map is provided with each drawer/box. 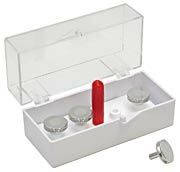 The PELCO® pin mount storage cabinet can also be used to store larger diameter pin mounts (up to 100mm/4") or for pin type specimen holders with a maximum height of 32mm (1-1/4"). The cabinets are made of sturdy and non-corrosive high density polyethylene, the drawers and clear boxes are made from impact polypropylene. The PELCO® 5 drawer pin mount storage cabinets are stackable with interlocking grooves. Outside dimensions of the cabinet are W15-1/2" x D14-1/2" x H16" (39.5x37.8x40.6cm). The internal dimension of the boxes in the drawers are 13-1/8" x 8-7/8" (33.3x22.5cm) with a maximum specimen height of 1-1/4" (32mm). The clear plastic boxes are also separately available. Two storage cabinets shown stacked.